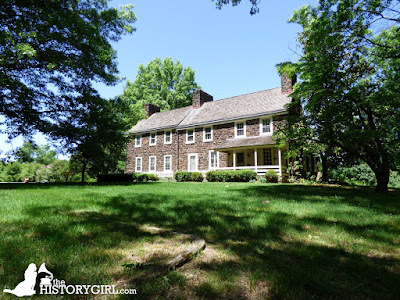 Reviving the Colonial at Peachfield ~ The History Girl! Not far from Interstate 295 in Westampton, New Jersey is a beautiful stone home, set back from the road, in a grove of mature trees overlooking acres and acres of farmland. For almost 300 years, this undeveloped area has remained agricultural thanks to efforts by a female preservationist, who transformed and revived Peachfield from ruins back to its former glory. The first settler in the area around Peachfield was John Skene, a Scottish-born Quaker, who emigrated to America around 1682 because of persecution for his religion. He settled near Burlington and purchased over 500 acres of land for a plantation. He laid out his property and, for reasons unknown, called it "Peachfield," although the immediate soil surrounding the present-day home is not suitable for growing peaches. From 1685 to 1688, Skene was appointed by Governor Edward Byllynge, the first Governor of West New Jersey, to serve as Deputy Governor of West Jersey. It is worthy of noting that Byllynge never set foot in New Jersey. Skene was also the presiding Justice of the Burlington Court from 1685 to 1690. He was a Freemason, having been a member of Aberdeen Lodge No. 1 in Scotland, and is cited as the first Freemason to settle in the New World. Skene's widow, Helena Fullerton, sold Peachfield in 1695 to Henry Burr. Henry Burr built the east portion, or right side of the home, in 1725. The home, constructed of stone, was originally four bays wide and one room deep. It is believed that this was a rather sophisticated farmhouse for being in a rural area. Henry's son, John Burr, built the west portion, or left side, in 1732. Before it was completed, John died, leaving behind his wife and children to live in that portion of the home. The property remained in the Burr Family for 200 years. It was purchased by the Clark family in 1897. The family lost the farm during the Great Depression but continued to rent the property. All but the exterior walls of the home were destroyed by fire in 1928. It is believed that lightning struck the house and caused the fire, but at least one Clark descendant has said that it was a kitchen fire that started in the hearth but was covered up as a lightning strike. The burned-out shell was purchased by Norman and Miriam Harker in 1931. The Harkers engaged the services of architect Richardson Brognard Okie to restore the home to its original appearance, plus an addition at the rear and few modern touches and upgrades, including electricity and plumbing. Okie was a New Jersey native, born in Camden in 1875. He graduated from the architecture program at the University of Pennsylvania in 1897. In 1898, he formed a partnership with architects H. Louis Duhring, Jr. and Carl Ziegler, that lasted until 1918. He practiced independently until his death in 1945. Throughout his career, he became well-known for his Colonial-Revival homes and his sensitive restorations of historic buildings. Some of his notable projects include the reconstruction of George Washington's "President's House" for the 1926 Sesquicentennial Exposition in Philadelphia, the reconstruction of Pennsbury Manor along the Delaware River in 1930, and the restoration of the Betsy Ross House in 1937. The restoration of Peachfield was guided by Okie's familiarity of Southeastern Pennsylvania farmhouses, which were constructed of undressed fieldstone walls, similar to those at Peachfield. Care was taken to ensure that the materials brought into the house were authentic to the period of construction, down to the floorboards and window panes. Miriam purchased individual window panes for fifteen cents each from historic homes. As older homes were being torn down, Miriam would visit and see what could be salvaged for her home. The mantel in the older section of the home came out of a nearby circa 1700s Burr homestead. Okie's trademarks can be found on the second floor, where there is a plaster wall with a rounded corner and at the rear of the home, where the fieldstone is randomly placed within a field of stucco (see above photo). Miriam decorated the house true to the period, with antiques and furniture appropriate for the colonial home. Miriam's work in preservation did not end at Peachfield. She was a founding member of the Association for the Preservation of Historic Burlington County and organized a campaign to save the historic Burlington County prison in Mount Holly, now a museum. Upon Miriam's death in 1965, she bequeathed Peachfield and 120 acres to the National Society of the Colonial Dames in the State of New Jersey. The Dames, established in 1892 and dedicated to historic preservation, patriotic service, and educational projects, moved their headquarters from the Old Barracks in Trenton to Peachfield. A number of dilapidated barns remained toward the rear of the home's property but were eventually removed. The only surviving outbuilding is an icehouse located behind the home. Today, the Dames continue to use the home as their headquarters and as a house museum. The membership is currently trying to restore and recreate Miriam's colonial revival gardens. Monthly programs and tours allow the public to see this meticulously restored colonial exterior and colonial revival interior.